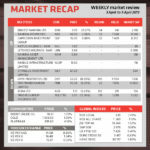 The local market was active this week, with the NSX Local index up 1.76% at 635, and the NSX Overall Index up 1.13% at 1369. As at 9 April, FirstRand Namibia was the largest local company on the exchange, with market capitalization of N$ 10.8 billion, followed by Namibia Breweries with N$ 10.1 billion, Trustco Group with N$ 9.3 billion, and Capricorn Investment Group with N$ 9.3 billion. 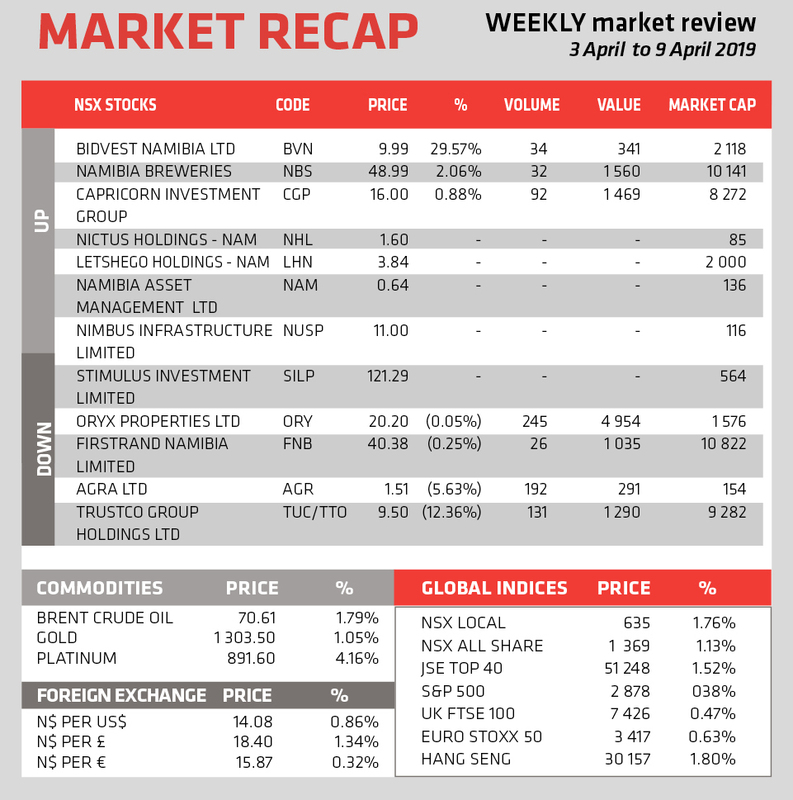 Bidvest Namibia lead the market this week, with growth of 29.57% to close at N$ 9.99 per share, with Namibia Breweries in second place, closing at N$ 48.99 per share after growth of 2.06%. In terms of volume Oryx Properties lead the market with N$ 4.9 million worth of shares traded, with Namibia Breweries in second place with N$ 1.5 million worth of shares traded. The local currency gained 0.86% against the US Dollar, to close at N$ 14.08 per USD, and gained 1.34% against the British Pound, to close at N$ 18.40 per GBP. It closed at N$ 15.87 against the Euro, a gain of 0.32%. The Monetary Policy Committee of the Bank of Namibia met on 10 April, and announced that the repo rate will be left unchanged at 6.75%. They argue that this will support the domestic economy while supporting the peg to the Rand. They note that economic activity has slowed during the first two months of the year compared to last year, specifically in sectors such as mining, agriculture and construction. However, sectors such as transport and communication, wholesale and retail trade as well as manufacturing improved during this time. They note that the stock of international reserves stood at N$32.6 billion, and that it should be enough to cover 4.3 months of imports of goods and services, while remaining sufficient to protect the currency peg and meet the country’s international financial obligations.